Are your old doors constantly stuck shut and fitted with with an insecure security system? Do you want a home with WOW factor timber windows and doors? Whether you live in a country cottage, a regency townhouse or you're building a contemporary new grand design - we're here to help you! For over 30 years we have been helping our clients create beautiful living spaces that keep the warmth in and the winter weather out with our made to measure wooden windows and doors. And when your building work and renovations are over, we'll also help you kit it out just how you need it to be with our bespoke furniture. Designed to your desires or made to measure to fill every nook and cranny of space available! We offer a wide range of timber windows to suit all properties from Listed Buildings to Self-Build Properties. However old or new your property, choosing the right windows for your home is an important decision. We all know that a well-presented home is worth more than one that shows signs of neglect or inappropriate UPVC windows. By choosing to install wooden windows you will add warmth, security and value to your home. We offer a range of opening layouts including fixed and direct glazed options and we can advise on aesthetic details, such as astragal or glazing bars to suit your property. Pre-painted/stained in house in a colour of your choice. We apply a minimum of 3 coats. Fitted with attractive ironmongery for added security and performance. To give your new wooden windows the best start in life, all of our windows are supplied fully painted or stained by our specialist joinery coatings team. All of the windows are spray coated for extended weather protection and durability. By spray painting the windows, we can ensure that every part of the window is evenly coated, leaving a smooth finish without brush marks and blemishes. We only use water-based stains, primers and topcoats from leading manufacturers for long term durability. Our traditional Box Sash Windows are based upon original designs with cords and weights which act as a counter balance. 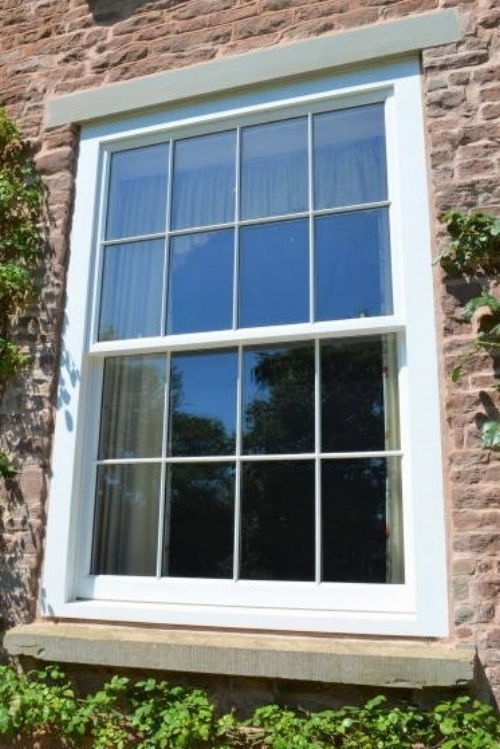 Balance Sash windows are a modern take on the traditional cord and weighted sash windows and use a spiral spring balance mechanism..
All sliding sash windows can be specified as either fixed, top or bottom sliding or a combination of both. Sash Eyes - fitted to the top sash to allow for easy opening. Security Stops - these allow the window to be opened up to 25mm for ventilation but maintaining security. Fitch Fasteners - A traditional locking catch. Sash Lifts - fitted to the bottom sash for easy lifting. Our specialist paint suppliers have developed coatings that are designed to give maximum long term protection to your timber windows. This is supported by a long term warranty against the failure of the coating. Our windows will only require a minimal amount of maintenance each year - consisting of wiping down the windows to prevent the ingress of dust and dirt and an inspection of the coating to make sure that it has not been damaged or cracked. Thereafter, you will only need to repaint your windows every 5-8 years (depending on location and exposure)by simply wiping down with a liquid detergent and applying one coat of the original coating. Using only the most durable of timbers and the latest products in glazing, paint and ironmongery our windows and doors will last a lifetime with the minimal amount of maintenance. Stable Doors are often found in cottages and farmhouses and replicate a barn-style entrance where the door is horizontally split into two halves - allowing you to keep the lower half shut and the upper half open or both sections can be secured together and opened as one door. This style of door is ideal for keeping pets and small children indoors - whilst allowing fresh air to circulate the property. 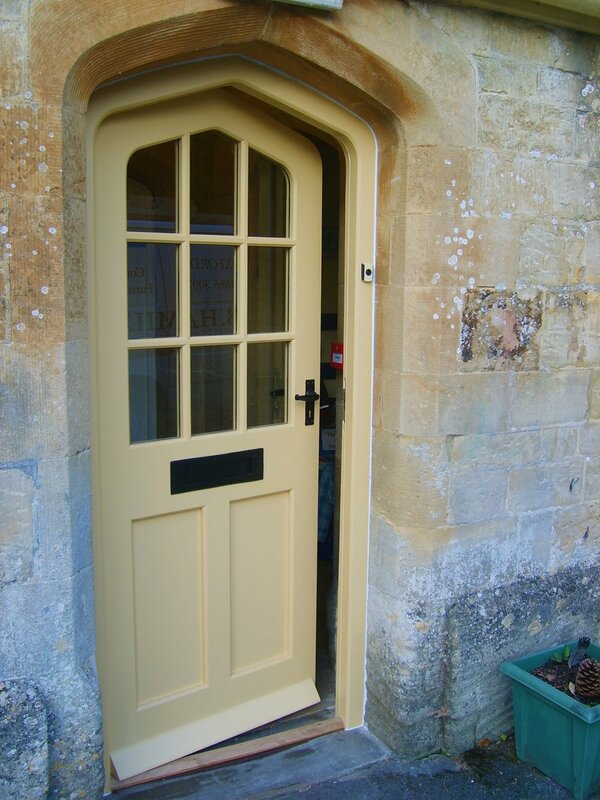 The installation of a beautiful bespoke wooden front door can greatly enhance the character of a property and give an impressive welcome to visitors. We offer door designs to suit a range of traditional style homes, including those built in the Edwardian, Victorian, and Georgian eras. French doors add a timeless feature to a property and bring the home and garden features together. French door designs are available with the option of glazed sidelights and fanlights to the side of and above the door themselves. We offer a bespoke furniture-making service for hand-crafted pieces of furniture that are designed to last for generations to come. Using time honoured techniques such as dove tail joints and mortice and tenons, all of our furniture is constructed from a combination of solid timber and veneered panels. From simple storage cabinets for the bedroom to home office suites and children's play rooms, we can create bespoke handmade furniture to suit your style and needs. Our furniture range includes bookshelves, tables, display cabinets, home-office furniture and kitchen larder units. It will help us with your enquiry if you can send photos and/or drawings of your project , with approximate sizes to: hello@longbarnhome.co.uk Please include your name, a contact number and tick the box below. Thank you for contacting Long Barn Joinery - we will endeavour to get back to you within 48 hours.